By the time a bathroom renovation takes place, it may be because you noticed the tile cracking and subflooring rotting. From Asian to modern and traditional or beach and open styles, a bathroom’s design can mean comfort and taste or functionality and efficiency. Whether you are a fan of his and hers sinks or a two-person shower and matching Jacuzzi tub, your taste can be made into the most functional bathroom for your needs. Wyeth Woodworking and Remodeling will take you through the planning process from design to paint color, tile size, bathtubs, showers, faucets and fixtures. Once you have successfully decided on your new bathroom design, Wyeth will work with you by showing you color schemes, vanities, cabinets, counters, single or double bathroom sinks, bath tubs and every other element that helps set the tone of your bathroom. The bathroom tile may be one of your most difficult decisions because of the vast array of styles, colors, and sizes to choose from. Choosing a new bathtub is one of the more exciting remodeling decisions. 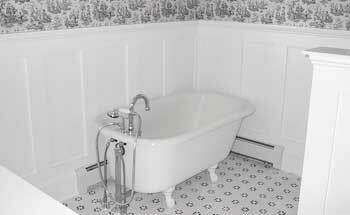 This is the homeowner’s chance to get rid of that old, uncomfortable rectangle tub and upgrade to something rejuvenating, massaging or more like a whirlpool tub. Whether you know exactly what you want or you need some tips, Wyeth Woodworking and Remodeling can transform your existing bathroom into a luxurious retreat that is just as functional as it is beautiful.